Purpose: To compare the effectiveness of phosphoric acid (H 3 PO 4 )-pumice compound with conventional hydrochloric acid (HCl)-pumice compound in treating different severities of dental fluorosis with the microabrasion technique. Materials and Methods: Sixty-seven anterior teeth from seven patients with different severities of dental fluorosis were treated. In each patient, half of the teeth were treated with HCl-pumice compound and the other half with H 3 PO 4 -pumice compound (split-mouth design). Both treatment compounds were applied for 30-second periods and treatment continued up to 10 minutes. Before and after treatment, standardized photographs were taken. The photographs were compared by two experienced observers unaware of the modality of treatment. Two indices of aesthetics, improvement in appearance (IA) and degree of stain removal (DSR), were determined according to a visual analog scale. The inter- and intra-correlation coefficients were made; then, statistical analyses were calculated using Mann-Whitney and t-test. Results: There were no significant differences in interobserver evaluation. Improvements in aesthetic indices were observed in all fluorotic teeth by both compounds; however, the mean treatment time with HCl-pumice was significantly lower than H 3 PO 4 -pumice. Conclusion: The H 3 PO 4 -pumice compound improved aesthetic indices in fluorotic teeth similar to the HCl-pumice compound. This study was conducted to compare the clinical efficacy of the two microabrasion compounds (HCL-pumice and H 3 PO 4 -pumice) in a split-mouth study design. In addition, pure microabrasion period for application of the two compounds in each side of the mouth was measured. Subjects with fluorosis were solicited by two experienced clinicians (MRR, MBR) among the patients who referred to The dental school. Subjects with extremely poor oral hygiene or periodontal disease and caries on anterior teeth were excluded. The clinicians carried out the evaluation using a mouth mirror, an explorer, and periodontal probe. At first, the teeth were cleaned with prophylactic paste to enable assessing them accurately. Then they were dried with cotton rolls, and within 30 seconds of drying, the degree of staining was determined. The investigators classified the patients into mild, moderate, or severe groups according to Dean's index for dental fluorosis. Dean's index was modified slightly for use in this study by combining the categories of mild and very mild. Before the clinical assessment, the observers were asked to classify photographs of fluorotic teeth from a previous study. Any disagreement with the previous classification was reviewed and discussed until consistency was achieved. Seven adults with diffuse opacities on enamel surfaces of incisors suggestive of dental fluorosis were selected [Figure 1], and written informed consents were obtained prior to beginning of the study. Color photographs of the teeth were taken by the same ring flash and camera. All photographs were taken at a pre-established, standardized setting and focal length in the same dental unit. Microabrasion treatment was carried out by one other calibrated operator (GB). For calibration procedure (step), the operator clinician (GB) treated two patients under the supervision of the experienced clinician (MMB). After that, the operator was considered qualified for initiating the microabrasion procedures. These patients were not enrolled in the study. Before treatment, eight anterior teeth were isolated with a rubber dam (Optra Dam, Ivoclar Vivadent). The method of application followed the split-mouth study design. For each patient, two compounds were randomly selected and designated 'left' or 'right'. Both microabrasion materials were used on each patient. A coin was tossed to determine the compound being applied to each side. A thick layer of microabrasion compound was applied over the discolored area of the facial surface of the affected teeth with a contra-angle handpiece in low speed. 'Treatment' was defined as a 30-second application of the microabrasion paste. Following each application (30 seconds), the compound was removed with wet gauze and the teeth were rinsed before the experienced observer (MMB) evaluated for the remaining stains of fluorosis. Are you a) very satisfied? b) satisfied? c) unsatisfied? Representative photographs from each patient were randomized and viewed independently by two other experienced clinicians (MBR, MRR) who were unaware of the kind of treatment. For training purposes, photographs of the teeth subjected to microabrasion technique and the representative of each score were observed. Then, both clinicians reviewed approximately 10 patients subjected to the microabrasion procedure at baseline and after treatment on two occasions (they were not included in the sample). A score was given for each case. An initial intra and interobserver agreement of at least 85% was considered necessary before evaluation of the photographs. Both sides of the mouth were evaluated using a visual scale ranging as described by Price et al. Two indices of aesthetics consisting of improvement in appearance (IA) and degree of stain removal (DSR) were determined according to a visual analog scale from 1 (no improvement in appearance or stain not removed at all) to 7 (exceptional improvement in appearance or stain totally removed). The mean rank for IA and DSR in the two techniques were measured and Mann-Whitney test used for analysis. The mean of treatment time (period) in each experimental group was measured and t-test was used for comparison. Both observers identified a difference (improvement) between pre and post-treatment photographs in all patients. The interclass correlation coefficient (ICC) between the two observers for IA and DSR were 0.772 and 0.837, respectively. The mean rank for IA in HCl-pumice and H 3 PO 4 -pumice groups were 6.58 ± 0.70 and 6.39 ± 0.75 [Table 1] and the mean rank for DSR in the HCl-pumice and H 3 PO 4 -pumice groups were 6.53 ± 0.79 and 6.36 ± 0.78 [Table 2], respectively. The t-test showed no significant difference between the two groups in this respect. The mean treatment time in the HCl-pumice group (53.03 seconds) was significantly lower than the H 3 PO 4 -pumice group (76.39 seconds). The t-test showed a statistically significant difference between these two groups (P = 0.001) All the patients reported being very satisfied at the end of the treatment. The affected enamel has normal thickness but increased white opacities with no clear borders with the adjacent normal enamel. 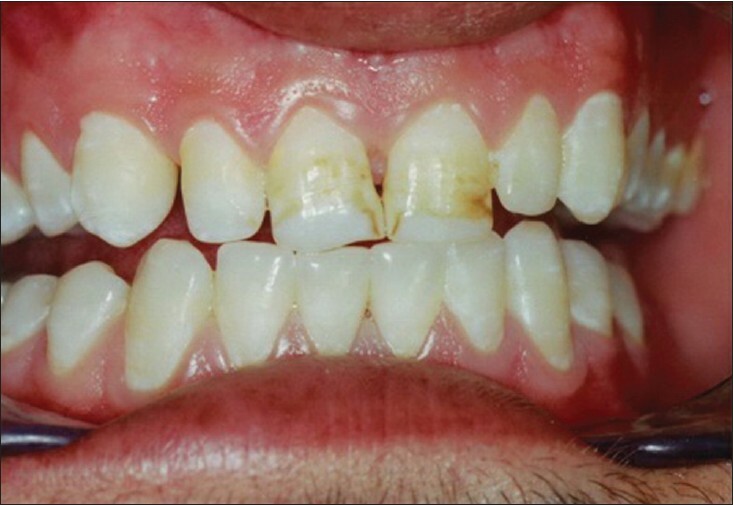 As other conditions may result in similar patterns of enamel damage, a definite diagnosis of fluorosis can be made when the defects present in a bilaterally symmetric distribution and evidence of prior excessive fluoride intake is established. In view of these facts, patient selection and photographic evaluation were performed by two experienced clinicians (MBR, MRR). For standardization of the treatment method, all patients were treated by one clinician (GB). Mild surface abrasion of the enamel prisms with simultaneous acid erosion compacts the mineralized tissue within the organic region of the enamel, replacing the outer prism-free region. Light reflected off and refracted through this new surface is thought to act differently than light from an untreated enamel surface. ,, In addition, subsurface stains may be camouflaged by the optical properties of the newly microabraded surface. Croll has named this phenomenon 'the abrasion effect'. Comparison of mean treatment time period between the two groups showed a significant statistical difference (P < 0.05). In other words, microabrasion with H 3 PO 4 -pumice compound takes more time, although this time period (23.365 seconds) does not seem to be significant in clinical practice. Miereles et al. showed that enamel treated with H 3 PO 4 produced a rougher surface than enamel treated with HCl. The increased roughness observed with H 3 PO 4 could be attributed to a less aggressive decalcification, producing a selective conditioning pattern on enamel surface, leaving a more granular and irregular surface. They showed that the mean surface roughness was statistically lower for HCl than H 3 PO 4 and deeper demineralization and a larger total demineralization area was observed for HCl. Similar results were observed by Mendes et al. It seems that the H 3 PO 4 -pumice compound can be used safely in dental clinics and similar improvement in appearance will be obtained. Enamel microabrasion using HCl-pumice or H 3 PO 4 -pumice compound is effective and safe for removing enamel dysmineralizations and improves the appearance of the teeth; however, faster results are obtained with HCl-pumice compound. All subjects (100%) reported to be very satisfied upon completion of the microabrasion treatment. The authors wish to thank professors Mohammad Bagher Rezvani and Mohammad Reza Rouhollahi for their assistance in selection of patients and evaluation of photographs. 1. DenBesten PK. Biological mechanisms of dental fluorosis relevant to the use of fluoride supplements. Community Dent Oral Epidemiol 1999;27:41-7. 2. Bezzerra AC, Leal SC, Otero SA, Gravina DB, Cruvinel VR, Ayrton de Toledo O. Enamel opacities removal using two different acids: An in vivo comparison. J Clin Pediatr Dent 2005;29:147-50. 3. Nevil BW, Dann DD, Allen CM, Bouquot J, editors. Oral and Maxillofacial Pathology. Philadelphia: Saunders, An Imprint of Elsevier Inc.; 2009. p. 54-8. 4. Lynch CD, McConnell RJ. 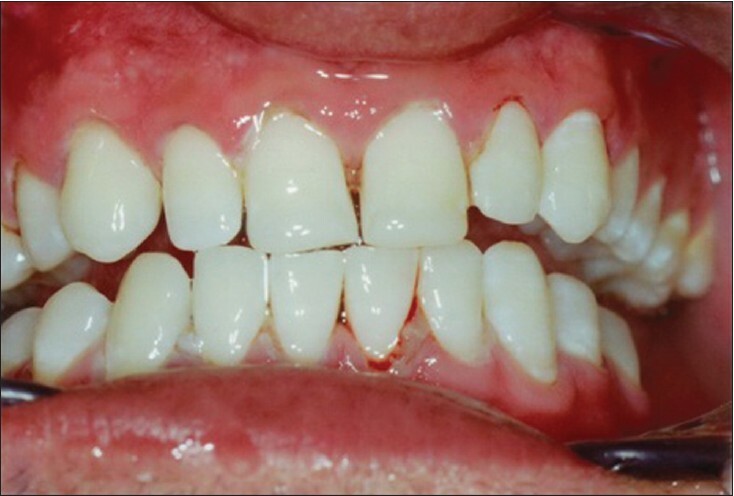 The use of microabrasion to remove discolored enamel: A clinical report. J Prosthet Dent 2003;90:417-9. 5. Croll TP. A case of enamel color modification: 60-year results. Quintessence Int 1987;18:493-5. 6. Croll TP, Cavanaugh RR. Enamel color modification by controlled hydrochloric acid-pumice abrasion. I. Techniques and examples. Quintessence Int 1986;17:81-7. 7. McCloskey RJ. A technique for removal of fluorosis stains. J Am Dent Assoc 1984;109:63-4. 8. Croll TP. Enamel microabrasion: The technique. Quintessence Int 1989;20:395-400. 9. Miereles AA, Andre Dde A, Ledia FL, Bocnagel JS, Demarco FF. Surface roughness and enamel loss with two microabrasion techniques. J Contemp Dent Pract 2009;10:58-65. 10. Price RB, Loney RW, Doyle MG, Moulding MB. An evaluation of a technique to remove stains from teeth using microabrasion. J Am Dent Assoc 2003;134:1066-71. 11. Terry DA. A biomodification of tooth discoloration. Prac Proced Aesthetic Dent 2006;18:226-9. 12. Croll TP. Enamel microabrasion for removal of superficial dysmineralization and decalcification defects. J Am Dent Assoc 1990;120:411-5. 13. Segura A, Dooly KJ, Wefel JS. The effect of microabrasion on demineralization inhibition of enamel surfaces. Quintessence Int 1997;28:463-6. 14. Aoba T, Fejerskov O. Dental fluorosis: Chemistry and biology. Crit Rev Oral Biol Med 2002;13:155-70. 15. Paic M, Sener B, Schug J, Schmidlin PR. Effect of microabrasion on substance loss, surface roughness and colorimetric changes on enamel in vitro. Quintessence Int 2008;39:517-22. 16. Croll TP, editor. Enamel Microabrasion. Chicago: Quintessence; 1991. p. 27-60. 17. Donly KJ, O'Neil M, Croll TP. Enamel microabrasion: A microscopic evaluation of the "abrasion effect". Quintessence Int 1992;23:175-9. 18. Cvitko E, Swift EJ Jr, Denehy GE. Improved esthetics with a combined bleaching technique: A case report. Quintessence Int 1992;23:91-3.